The new muppet movie, written by Jason Segel and Nicholas Stoller, is a total delight. Any fears that the muppets may have been unwisely thrust into something that is outside of their inherent character can be safely allayed. This muppet movie is so true to the spirit of the original Muppet Show, and at least the first three movies, that it really feels as if Jim Henson were still alive: you really get the sense that this is a movie he might have made. It is also absolutely in keeping with the muppet universe: it is not any sort of re-boot or reimagining: it completely continues the arc that began with the very first muppet show. In every regard, with the exception of some different muppeteers (Jim Henson, who played Kermit, is dead, and Frank Oz, for whatever reasons, declined to perform Miss Piggy) this is a deliriously faithful continuation of the muppet world. The concerns stemmed not just from Jim Henson’s death but also from his late-in-life decision to sell his creations to Disney. 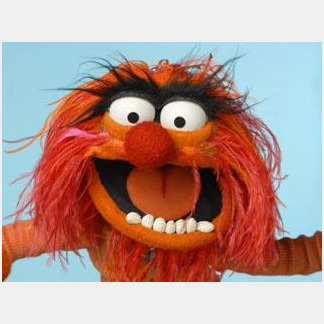 Legitimately, people were afraid that the characters of the muppets could have been corrupted. With a big high-five to everyone who has ever loved the muppets, I can state uncategorically that this is not the case. Segel and Stoller obviously love the muppets and they’ve made a pure muppet movie. The casting is perfect. As the two main humans, Segel and Amy Adams are as close to muppets as humans can be (and, to this man at least, Adams is as cute as any muppet – even the dancing chicken). Chris Cooper plays the Bad Guy as a perfect muppet Bad Guy. The songs, by Bret McKenzie from Flight of the Conchords, are perfect: funny, funny, funny, but also spectacularly thought out and arranged. I can not only hum them, I can sing them. For those of us for whom the first film is some sort of milestone, there are huge rewards. The plot allows, completely muppet-logically, for a re-creation of the famous television show Opening Number as well as a tearfully joyous new version of The Rainbow Connection. All of your favourite muppets are there (yes, Swedish Chef, yes chickens, yes the big ones, yes Scooter and Gonzo and Waldorf and Statler and Tweeter and Crazy Harry and Sweetums and Sam Eagle and Link Hogthrob and The Newsman and the rats) – look, they’re all there, as though Segel and Stoller, every step of the way, had our best interests at heart. They obviously did. They obviously made the muppet movie they wanted to see, and that’s the one we wanted to see too. It is also hysterically funny. There is so much off-beat (but always muppet-style) humour, gags that you simply can’t see coming but which are seriously laugh-out-loud funny. The first half hour, in particular, is a riot. The screening audience I shared it with was in huge, hearty high-spirited laughter throughout the film. 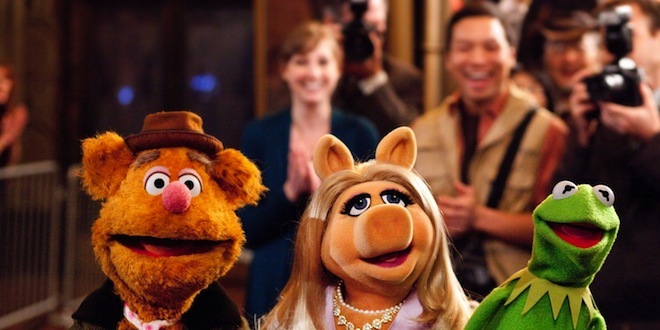 It also has the tremendous heart of the series, the original movies… the muppets themselves. Why isn’t this a five-star film? Well, there are one or two slow spots. Chris Cooper’s villain, although well played, is almost unnecessary, and his subplot lacks energy. And maybe it could have had more music, or the plot could have taken one or two more surprising turns. 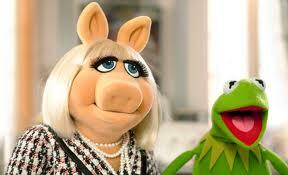 Maybe they could have figured out a way to make Miss Piggy a little more dynamic. Animal’s journey doesn’t really pay off. And, really, Raging Bull is a five-star film, and The Muppets isn’t Raging Bull. But it’s great. I don’t know how a kid who didn’t grow up on the muppets might relate to it (it’s similar to The Adventures of Tintin in that way) but for anyone my age, who loved the muppets – you’re going to love this movie. A sort of triumph. What Would Oliver Stone Have Done?